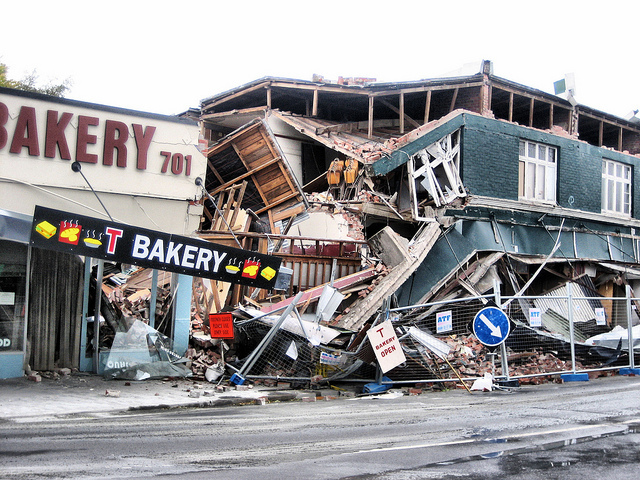 On February 22nd at just before 1pm, a devastating earthquake, measuring 6.3 on the Richter scale, and just 10km deep, hit Christchurch, the second biggest city in New Zealand. So far over 160 people have been officially declared dead and that toll is expected to rise to over 200. The earthquake came less than 6 months after a destructive 7.1 magnitude shock, which claimed no lives but saw thousands of homes and buildings damaged or destroyed. In the wake of the February quake, a number of grassroots groups and networks have sprung up across the city to help people access the resources and support they needed to survive. Beyond Resistance, an anarchist group, was heavily involved in providing support in the working class suburbs of Avonside and Linwood, while other members also got involved in the relief effort in other parts of the city. For many residents in the hard hit working class Eastern suburbs of Christchurch, aid from the Government, City Council and large NGOs such as the Red Cross was sorely lacking. More than 2 weeks on from the quake, many still have no (or extremely limited) power supplies and no running water. State-provided portaloos and chemical toilets are still far from accessible for many residents. In Linwood, Beyond Resistance members set up a community kitchen in the front yard of two members’ house within hours of the earthquake. From here they distributed meals, gas canisters, water, hand sanitiser, facemasks (huge amounts of pollution and dust were spread by high winds) and other much needed supplies. They engaged in door-knocking around Linwood and Avonside to assess people’s needs and organised bike deliveries of food, water and gas (many of the roads are still impassable by car). More details about the work they have been doing can be found on their website, http://beyondresistance.wordpress.com. Over the coming days, weeks and months, Beyond Resistance members will continue to help provide resources to people who need them. Additionally, they are working to link up the various neighbourhood based support groups scattered across the city. They also plan to organise politically to try to ensure that the rebuilding of Christchurch is done in a way that meets the needs of residents, not business and the state. They will be active in organising against Government cuts to services around the country that use the earthquake as an excuse to further punish working class people (both employed and unemployed) for the benefit of the wealthy.